The former Prime Minister of the United Kingdom, Winston Churchill was once prescribed alcohol by his doctor in New York City. 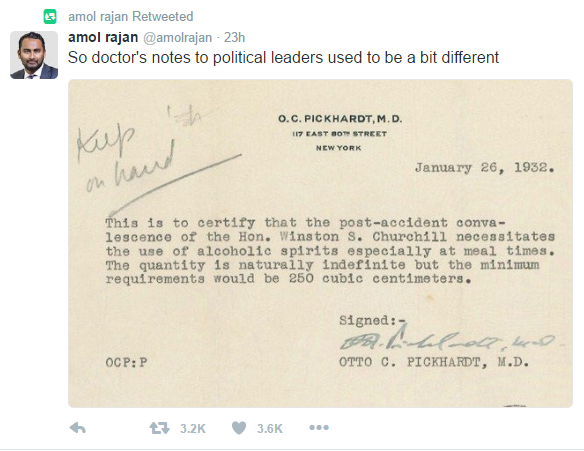 His doctor, Otto Pickhardt prescribed the British statesman a minimum of 250 cubic centimeters of alcohol during meal times following an accident that he had gotten into the year before. That is equivalent of roughly a cup or a quarter liter of alcohol during his meals. On December 13, 1931, Churchill was walking across the street, he was struck by a car driven by Edward Cantasano, an unemployed mechanic living in Yonkers. Churchill said that it was entirely his fault for getting hit because he forgot that traffic keeps to the right in the United States as opposed to the left in the United Kingdom. Churchill also seemed to be slightly in a rush because he was having trouble finding the house of financier Bernard Baruch. He was in a taxicab at the time but after having trouble finding the house, he elected to get out in the middle of the road and tried crossing the street while looking the wrong way. He required a prescription to obtain alcohol at the time since the accident was during prohibition. Churchill later wrote his own account of what happened titled “My New York Misadventure” in the Daily Mail.